I know I said earlier today I’d be back tomorrow for a mid-week pick-me-up, but I’ve got a little something to share with you before then! I’ve got a four way fashion face off for you tonight! Yes, that’s right, a four way fashion face off! (How’s that for alliteration?! *applause*). It all has to do with this Marc by Marc Jacobs Dress. I’ve spotted three ladies in it recently, and I spotted a fourth lady rocking a very similar, but completely budget friendly version, too! Can you catch which one of the four is the budget friendly version? It’s the second photo – Katy. I must all look great in this dress – it’s clearly a matter of personal preference as to who wore it best. I’ll leave everyone to their own opinion – my purpose in sharing this is not to bash, but rather to look at how one dress can be worn so many ways! I find that truly fascinating! Many of you already know that Mod Cloth often has Anthropologie look-alikes. Well, that sounds great…get the Anthro look for less! But when you compare price and overall visual aesthetic, which comes out on top? That’s what we’re going to look at today! The system will work like this: I compare Anthro and Mod Cloth look-alikes and dub one the winner of overall aesthetic and then one the winner overall (with price is factored in). Just for fun, I’ll also look at the names and dub a winner in that category. However, the name won’t factor into either of the other categories. Ready for some fun? Let’s get started! Overall Aesthetic: Hmm…this is actually a bit hard for me. You see, personally, I’m just not a huge fan of either. So how do I decide which wins? Look at how they’re styled, of course! Overall Aesthetic (con’t): For the most part, I think both are styled well. But I think I might just have to go with Mod Cloth! Overall: Mod Cloth! Its price is unbeatable! Name Game: It’s a close one, but I have to go for Mod Cloth’s clever take. Wow! A Mod Cloth sweep for the first round! Overall Aesthetic: Anthro wins! Mod Cloth’s version just looks a bit cheap, especially in comparison to Anthro’s! Overall: Anthro! The price to pay for quality isn’t too, too bad in comparison to Mod Cloth’s version! Name Game: I don’t love either of these names for these particular skirts, but if I must decide, I’ll go with Anthro. Overall Aesthetic: Anthro, for sure! It has such a retro, yet sophisticated vibe to it. Love the chambray too! Overall: Anthro! Sure it’s more expensive, but I think it would be worth it to get a more one of a kind skirt! Name Game: Anthro! Its name fits the casual skirt! Overall Aesthetic: Mod Cloth’s version is definitely party attire, not work (look at its short length!). Anthro’s, on the other hand, is definitely fit for work (as well as other occasions). So which of those is better? I have to go with Anthro…sometimes short and lacey just don’t go together (that’s what Mod Cloth’s version is). Anthro’s is much more versatile, and beautiful! Overall: I have to go with Anthro, even though the price is much higher. It’s more versatile though, so you’d probably get more wears out of it anyway. On sale, Anthro’s would be an even better option! Name Game: I can admit that each name fits its respective skirt. So can I call it a tie? That means the ultimate winner of this duel is…. Ready, Set, Go! It’s a DRESS Duel! It’s time for another duel between Anthro and Mod Cloth, but this time with dresses only! Like last time, we will compare in the categories of “aesthetic”, “overall”, and “name game”, although the name will not factor into the overall category. It’s more for fun. Anyway, get ready to have some fun with this! Anthro’s Cathedral Windows Dress, $418, and Mod Cloth’s Los Angeles, 2019 Dress, $72.99. As I’m sure all of you know, the Cathedral Windows Dress has gotten a lot of negative feedback. To be honest, I’m not a huge fan of Mod Cloth’s version here either. That’s okay…we don’t have to only compare items that we love. Here, it’s a battle of the two evils. Aesthetic: This is hard. I really need to see the Anthro dress in person to be able to give this duel a fair battle, but I guess I’ll have to go with Mod Cloth. Overall: No way is Anthro going to win with its huuuge price tag, so Mod Cloth it is! Name Game: Anthro wins. Mod Cloth’s is too long for me. Anthro’s name at least paints a pretty picture! Aesthetic: While both have admirable features, Anthro’s sophisticated number wins, in part due to the cheap looking buttons on Mod Cloth’s dress’s back. Overall: Either could work nicely, but Anthro wins. $118 is not bad for an Anthro dress. Name Game: Again, I feel Mod Cloth’s is just too long. Anthro wins, making this round an Anthro sweep. Anthro’s Catmint Dress, on sale from $148 to $79.95 and Mod Cloth’s Scavenger Hunt Dress, $54.99. Aesthetic: These two put up a fight. Mod Cloth gets points with its buttons on the back that blend in with the dress. Anthro gets points for its refined vintage feel. They’re both cotton. Hmm…I guess I have to go with Mod Cloth, for the fun vibe. For others deciding, it could come down to the occasion for which it’s being worn. Overall: Again, it’s a tossup, but I’ll have to go with Mod Cloth. Name Game: Mod Cloth has a chance at this one, but Anthro still pulls out on top. Anthro’s In the City Dress, $128, and Mod Cloth’s Hopeless Romantic Dress, $57.99. Aesthetic: Anthro wins. I’m afraid Mod Cloth’s version looks a bit cheap. Overall: This is a tough one. Anthro’s dress wins for aesthetic, but it’s way overpriced. I think it’s style fits in better at Urban Outfitters, with a price to go along with that. Mod Cloth’s version’s price is right, but the design isn’t quite there. See the dilemma? What to do? As much as I hate to have to decide, I’ll go with Anthro. Name Game: I do love the city (NYC!! ), but I have to go with Mod Cloth’s. Anthro’s Drifting By Dress, $168, and Mod Cloth’s Million Dollar Smile Dress, $169.99. Aesthetic: Both have an aire of luxury and are silk, but Anthro has that extra bit of sophistication Mod Cloth’s doesn’t have. Both could be fabulous choices though. Overall: Mod Cloth’s costs more than Anthro’s (yes, only about $2, but still)?!! I couldn’t believe this! Anthro wins this one. Once again, I will say that either could work though. Name Game: Anthro. Mod Cloth has an interesting name, but I don’t feel like it totally fits the dress. Is this just me? Anthro’s Traced Twirls Dress, $158, and Mod Cloth’s Cherry Valence Dress, $99.99. Aesthetic: Mod Cloth’s, while fun, once again lacks that oomph of sophistication that Anthro effortlessly delivers here. Overall: If styled correctly, I could give this to Mod Cloth, but I just can’t. Anthro wins. The extra money is worth it. Name Game: Both names fit their dress well, but I’ll give it to Anthro. Anthro’s Little Navy Tea Dress, $188, and Mod Cloth’s Don’t Delay Dress, $73.99. Aesthetic: Mod Cloth’s is fun, yes, but Anthro’s is timeless, giving it the win. Overall: While I truly love Anthro’s, Mod Cloth’s look for less will work wonderfully too, so it wins. Name Game: Anthro. Mod Cloth’s has a disconnect for me. Anthro’s Pueblo Dress, $148, and Mod Cloth’s You’re A Stitch! Dress, $47.99. Aesthetic: Both are cute enough options, but believe it or not I actually prefer Mod Cloth. For my style and taste, Anthro’s print just doesn’t appeal to me as much. Overall: Mod Cloth’s, because you can’t beat their price! Name Game: Anthro’s name might be literal, but I think it works with the dress better than Mod Cloth’s name does with its dress. So Anthro it is! Anthro’s Chocolate Chip Dress, $128, and Mod Cloth’s Sweet Little Somethings Dress, $64.99. Aesthetic: For me, Mod Cloth’s is too nightgown-ish. Anthro wins. Overall: Although I could see making Mod Cloth’s version work (accessorizing it to make it less nightgown-ish would help! ), I prefer Anthro. Name Game: I do like Mod Cloth’s name here, and it works with its dress. However, being a sucker for baked goods, Anthro wins. That wraps up this duel! Time for the results: Anthro wins the category of “aesthetic”, winning 66% of the time. In a closer race, Anthro wins the “overall” category, winning about 56% of the time. And finally, in the “name game” category, Anthro wins hands down, a whopping approximate 89% of the time (that means it lost this category only once). So, Anthro wins all the categories! The last duel we had, Anthro won “aesthetic”, Mod Cloth won “overall”, and they tied for “name game”. Looks like Anthro is starting to pull ahead! What are your thoughts readers? Do you majorly disagree with me? Do tell! It’s a duel and it is on! The online community has been buzzing about the Hallowed Halls Oxfords from Anthro, pictured left and at $128. Mod Cloth’s Bow’n Places Heels are sold out at the moment, but they go for the price of $117.99. Name Game: This one is a toughy. Both paint a nice picture…Anthro makes me think of walking down the halls at an institution such as Harvard (I know that doesn’t totally work with the definition of “hallowed”, but give me this one please?!). But in the end, Mod Cloth’s name is just too cute for it not to win! EDIT: Julie left me a comment letting me know that, in fact, these two are more than just look alikes. They are the same brand, All Black. I apologize for the mistake on my part. It just goes to show you that better photography really does make a difference (I think that the reason Mod Cloth’s version look cheaper/more drab is due to the photo quality). Anthro’s Ringsend Heels ($90) aren’t quite as look-alike as Mod Cloth’s Brown Butter Heels ($67.99), but they have the overall same vibe. Aesthetic: Again, got to give this one to Anthro…refined and polished. Overall: If you have the money, Anthro would be prefered, but in the end Mod Cloth will give the same feeling and therefore wins. Name Game: Mod Cloth wins this one…brown butter…mmmm…makes me want to bake! Anthro’s Pin-Up Pumps ($90) look pretty much identical to Mod Cloth’s Come Dancing Heels ($92.99). Fooled? Don’t be. Turns out, they are identical. Overall: Anthro…same shoe, less money! Once again, Anthro’s Great Crossing Sandals ($98) aren’t twins with Mod Cloth’s T-Strap is for Terrific ($27.99). But still, they’re similar enough. Aesthetic: Anthro’s is too cute to resist. Overall: Mod Cloth’s price can’t be beat..they’re terrific (I crack myself up sometimes…okay, bad joke…in case you didn’t get it, look at its name)! Name Game: Anthro wins this one, making me think of deserts and to biblical times, painting a beautiful pictures. Mod Cloth is just to childish to me (sometimes stuff like that works, but in comparison to Anthro, it doesn’t). So who wins in this triple duel? Aesthetic: It’s a tie between Anthro and Mod Cloth’s Cricket Match Skirt. They’re near identical. The Cocktails skirt channels a little too much inner child for me, not giving off the same sophisticated vibe. Overall: Hands down, the Cricket Match Skirt because you can’t get its look-alike at Anthro anymore, and anyway, I’m sure it’s better than what Anthro’s price was. Name Game: Anthro wins this one…it just works for me and captures me. With a fun name like Cocktails in the Cabana, Mod Cloth is a close second. Overall: On sale, without question Anthro…however, Mod Cloth could work if you did the quick fix of replacing the buttons. Name Game: This one is hard for me. To be honest, neither capture my imagination a ton. Anthro’s name is intriguing, but I don’t see it fitting in with the sweater itself particularly well. I got to hand it to Mod Cloth, because I think its sweater and name at least correlate. Aesthetic: This is a toss-up and I’m not sure…Anthro has the vintage touch while Mod Cloth has the more modern infused…hmmm…perhaps Mod Cloth because it may be easier for more people to pull off?? Personal preference for sure here. Name Game: Unlike the last duel, Anthro has a name that grips me. So it’s Anthro for the win! Aesthetic: Although either shirt could really make an outfit, Anthro wins by a smidge with its more refined version. Really though, either could do. Overall: It’s a toss-up, but Anthro for me. Name Game: I actually like both these names quite a bit. Mod Cloth’s name fits with the shirt and I like that when you use thyme’s homophone time, it makes me think about wearing this classic shirt time and time again. However, Anthro wins because its name just makes me think of vacation and adventure, which is too hard to resist. It’s an Anthro sweep this round! Aesthetic: Although I’m not a fan of Anthro’s print on top, the dress still has more detailing (look at the bottom of the skirt, for example) and makes this classic silhouette all the more modern. So, Anthro it is. Overall: The price isn’t a huge difference, so Anthro pulls ahead. If Mod Cloth’s version was a lot cheaper than Anthro’s, perhaps it could have stood a chance. Name Game: Again, not in love with either name, but Mod Cloth would have to win. Its name points out that the piece is classic and a sure way to ensure style. Maybe this isn’t quite fair…it’s a blouse against a dress. But I can’t help it. They have a similar feel to them. It’s Anthro’s Tambour Blouse ($98) and Mod Cloth’s Summer Wheat Dress ($67.99). Aesthetic: Can I please call a tie on this one? I think they’re equally beautiful. If I had to choose though, I suppose I’d pick Mod Cloth for its rich mustard color, as opposed to Anthro’s light blue (which could be beautiful but could not work on certain skin tones). Overall: Hands down, it’s Mod Cloth for me on this one. You get a dress, so a more complete outfit, as opposed to a blouse, and it’s less money to boot. Not to mention that it’s gorgeous. Name Game: Another hard one this is proving to be! Both names fit their garment nicely. Perhaps…oh, this sure is difficult…umm…it has to be a tie! Both paint a great picture in my head and I just can’t choose! Aesthetic: This one is hard. 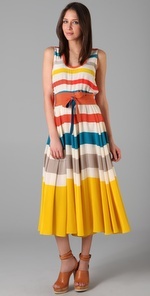 I love the pop of color from Anthro, but I have to admit I’m not a huge fan of the look of the stripes. Mod Cloth has a subtle pinstripe which is to die for (and a beautiful paper bag inspired waist), but it looks a bit drab when compared to the vibrant Anthro version. In the end, Mod Cloth wins! Don’t worry, there is a method to my madness! Overall: At nearly a third of the price of Anthro, it’s an easy win for Mod Cloth. To spice up the look, remove the brown belt and give the dress a dynamic replacement (that’s part of the reason it wins for aesthetic, you see). Gee, I almost have convinced myself to order this dress! Name Game: Although I’m kind of baffled by Anthro’s name (where are the dots?!! ), I like it better than Mod Cloth’s uptight name. Aesthetic: On it’s own, Anthro’s version is the more mature, grown up version of the two. With the right accessories, it could be modernized, but it has the potential for matronliness. Mod Cloth’s version is the hip, young, version with no need for rightly chosen accessories to “youngen” it (hehe, I made up a word, didn’t I!?). This is a tough one, but I’m going to have to go with Anthro, because it’s made of silk and Georgette, unlike Mod Cloth’s polyester version. Name Game: Both names hook me and fit their garment perfectly. It’s a toss-up here. I guess I’ll have to go with Mod Cloth, because its name paints a gorgeous, vivid picture in my mind (Anthro’s is gorgeous but more subtle…again this was a hard choice!). Aesthetic: I’m loving the effortlessness of the Anthro version, but the subtle stripe in Mod Cloth’s version puts up a hard fight. Hmmm….another hard one. If I had to choose, it would be Anthro, because again, it just looks refined. Overall: I don’t think you could go wrong with either of these, so with that being said, Mod Cloth wins (the price pushed it to victory). Name Game: Another hard one, but Mod Cloth wins. I think of Provence and lavender covering the landscape (wrong flower, I know, but still). And that wraps it up. But before I leave this post, let’s take a look at the final scores. Anthro comes out on top with 8 out of 13 votes for aesthetic (Mod Cloth with 3 and one N/A vote and one tie vote). Mod Cloth wins overall with 7 votes, although Anthro was close with 6. And finally, in the name game category, we have a tie! Mod Cloth and Anthro each got 6 votes and 1 tie! So what’s the moral of the story? It seems that Anthro usually creates the most gorgeous pieces, but if you’re on a budget, Mod Cloth can give you the same look for less. You just need to look around and you may be surprised with what you find. I hope you enjoyed this post! It was fun for me to write and I’d love to hear input (both on the type of post itself and content…in fact, you could do your own tally with the same pieces and I’d love to hear!). I’d be more than glad to do posts like this in the future if you readers enjoyed it!